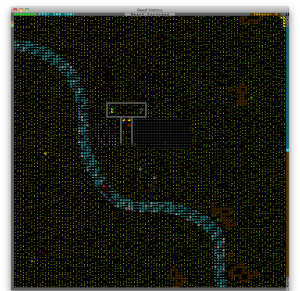 So that you don’t think miniatures are all I do these days, let me tell you a little about my current game of Dwarf Fortress. My intrepid crew of 7 dwarves embarked to an area in the southern end of the world, where some mountains, a forest, and a grassland came together at a brook. It’s always quite hot there, and all the lakes had dried up by the end of the first summer. The brook still flows freely, however, and will provide a good source of power should I ever try to pump magma up from the depths. 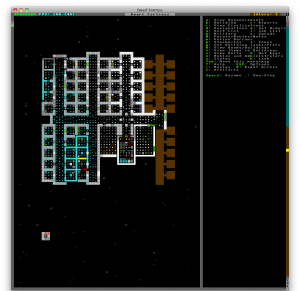 I’ve started building some above-ground fortifications around my entrance (just some ramps going downwards), and will be stationing marksdwarves to stand on top of them shortly, as I have been having increasingly frequent goblin and kobold incursions as of late. Tragically, this did include one goblin snatcher successfully stealing one of the children from my fort. Speaking of magma, I decided to explore in a generally downwards direction, hoping to find the fun of the caverns and the magma sea. I did break two layers of caverns, finding a vast underground sea and a number of interesting ores and many giant mushroom trees to be harvested. Unfortunately, my miners happened to dig into a pocket of rock that went down into the magma sea, and my legendary miner died a horrible flaming death upon digging out a diagonal corner that connected to the main body of magma. A memorial slab was erected in her honor, as her flaming corpse mysteriously vanished before I could send anyone to retrieve it. All I found on the stairs was a pile of her clothes and her pick-axe. That death left me with a mere 15 dwarves, but some combination of my burgeoning metalcrafting industry (which also requires clearcutting the forests, as I have not yet been able to pump up that magma) and the discovery of adamantine veins in the depths triggered successive immigration waves of 30-odd dwarves, and then another 10-15 to bring me to 60. This left my food, booze, and general accommodations completely overwhelmed. 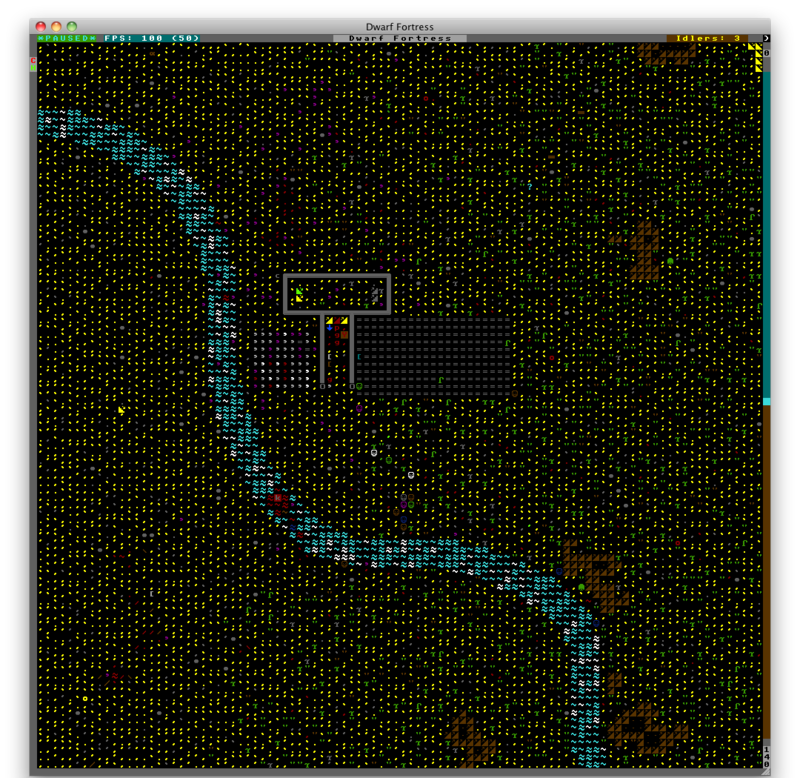 After a brief period where I had 5 dwarves gathered around my well to drink water (oh the horror! ), I slaughtered a bunch of animals, planted several more farm plots, brewed more drinks, and also built more stills, butcheries, and kitchens. I believe I am now set for food for a time, although I will still need to keep an eye on it. I’ve also been trying to rapidly build more bedrooms and workshops, along with all the accoutrements required therefore. I managed to get my mayor and captain of the guard happy with their required accommodations, but not before the mayor mandated that I build 3 ballista arrows and then banned their export. The only thing I have going in my favor for the bedrooms is that in the new version so many of my immigrants are married couples. 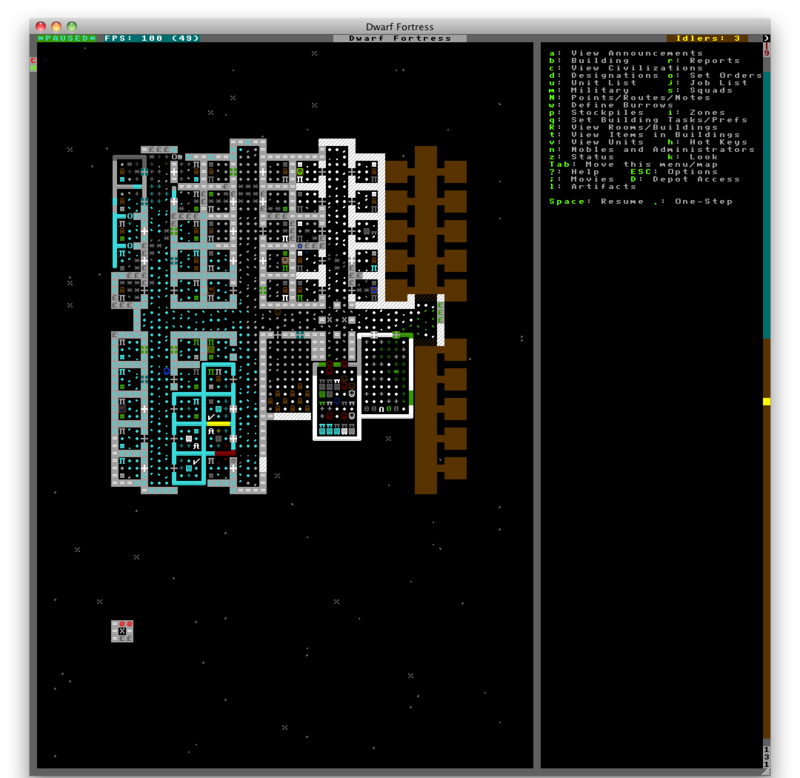 Two dwarves per room means I only have to build half as much stuff. Somewhere in there I also had one of my masons make my first artifact, bumping him up to a legendary engraver. I forgot to make a post for week 2 of my Journeyman league progress, so this one will count for both. Last week I got to add 4 points to my army, increasing it from 11 to 15 points. My main problems had been my inability to get across the field unmolested and gain first strike, and my lack of a semi-disposable light warbeast. I attempted to address these shortcomings by adding a Bull Snapper (3 points, has Spiny Growth) and the Swamp Gobber Bellows Crew (1 point, 5″ cloud template). I got mixed results with this. I still lost basically every game (we tie-broke one in my favor when we ran out of time due to the store closing), but they were generally a lot closer. Trying to move all the way up the field under cover of the cloud effect was incredibly frustratingly slow, however. For week 3, we added 10 more points, coming to a total of 25. I knew I wanted to add the full 5-man Gatorman Posse for 9 points, which left me with an awkward 1 point gap. My only 1 point options are another unit of Swamp Gobbers or a Feralgeist. While two 5″ clouds might be good, I don’t really want to double up on a unit when I’d probably be dropping it again at a higher points level. As for the Feralgeist, I’ve not given it a lot of thought, as I really only hear bad things about them from other people. Not liking either of those two choices, I instead dropped the Gobbers and added a 2 point Croak Hunter. He’s a fairly squishy frog-man solo, but has the skills necessary to threaten a key model of the enemy’s. I’ve only played one game with this list so far, which I won. It was a relatively unusual victory, however, with Calaban killing Xerxis in melee combat. Overall, though, the list (and I) performed acceptably, despite the Posse being killed to the man with frightening efficiency. You are currently browsing the Home of the Ghostlords archives for March, 2012.